As a celebration of the 20th anniversary of the One Piece series, Shonen Jump announced a new project under the code name “Dawn”. Revealed at Jump Festa in 2017 was the first trailer of the open world game: One Piece World Seeker. Fans of the anime and manga series have often dreamt of a game where they can actually explore some of the world that Eiichiro Oda created, and on the 15th of March, 2019, they will finally have that opportunity. Following the adventures of aspiring Pirate King Monkey D. Luffy and his crew: the Straw Hat Pirates, this will be a game set in the New World. Fans of the series will be aware of what this will entail, but for those not in-the-know: the New World is the second half of the Grand Line. This is the massive ocean where Gol D. Roger hid his infamous treasure: One Piece. World Seeker gives fans the opportunity to travel around “Jail Island” as Luffy, the series’ protagonist. With opportunities to use his rubber abilities, Luffy can swing across the town with his Gum Gum Rocket attack. He will also battle a wide range of opponents, from the Marines to other enemies such as the Vinsmoke family. Along with established characters are game only counterparts like Jeanne and Isaac. Isaac is the antagonist of the game and the head of “Jail Island” whilst Jeanne is staging a rebellion against him. Of course, there are combat elements to the game. These include stealth-modes which feature Observation Haki that will enable Luffy to see through walls, as well as what I would assume to be a melee and mid-range combat style. With an all-new original story created for this adaptation, fans can expect more than a re-telling of a tale they already know. This has been a factor that developers have already had with other games based on the series, like the One Piece Pirate Warriors trilogy. It will also be substantially different from the fighting games that are typically produced for Shonen series. After all, those are the safest bets for battle manga like Naruto and Dragon Ball Z – but there’s been more to One Piece than just the battles. At its core, One Piece is an action-adventure series, and it deserves a game that encompasses that genre. World Seeker will be available on PlayStation 4, Xbox One and Windows. Unfortunately, there is no news of the game coming to Switch – however, if fan interest is high enough the producers will consider it. A collector’s edition Gum Gum bundle is now available for pre-order. This includes a 21cm Luffy figurine as well as a replica of Luffy’s Gum Gum devil fruit. As an added bonus, there is a side mission for those who specifically buy this bundle which gives the player opportunities to find rare items and the like by finding rocks. 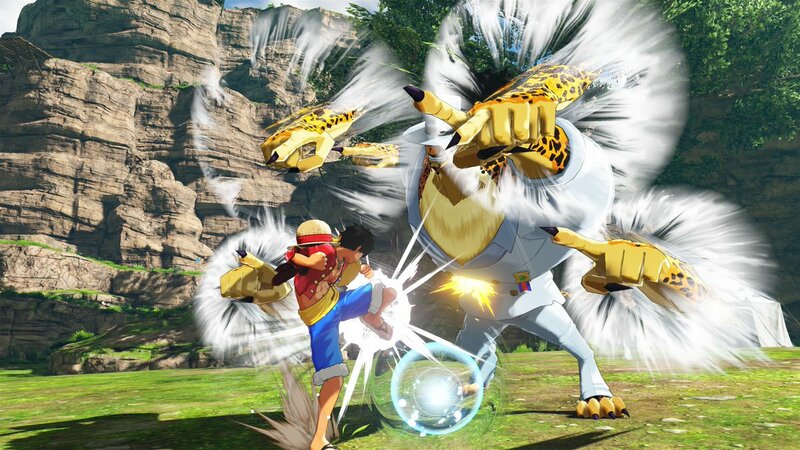 Another feature will be exclusive costumes for Luffy: a military-style outfit and a swimsuit.